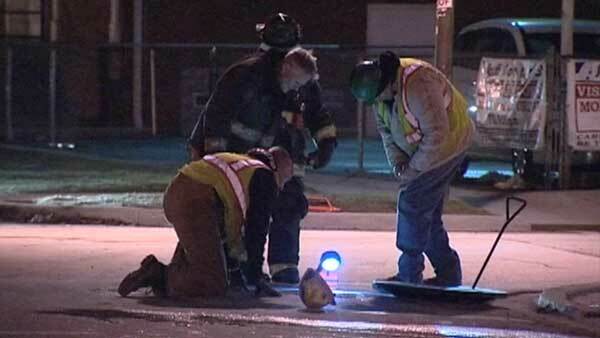 CHICAGO (WLS) -- A natural gas leak on Chicago's South Side forced some residents out of their homes as a precaution overnight. Witnesses said they could hear gas spewing out of a main near East 80th Street and South Crandon Avenue in the city's South Chicago neighborhood. Fire officials said the leak occurred around 11 p.m. Wednesday. Immediately upon arrival, firefighters got hoses in place in case of a fire. Peoples Gas technicians turned off the flow of gas to four multi-unit buildings so they could be ventilated. A warming bus was provided for the evacuated residents. They were all allowed back into their homes early Thursday morning. Peoples Gas said service was restored in the area and that appliances were checked and re-lit safely.